Encyclopaedia Metallum: The Metal Archives • View topic - The Committee - Live video @ Party San 2018 online! The Committee - Live video @ Party San 2018 online! Will be released on Cd(lim 50) and Tape(lim 50). The tape will have another cover art. Orders can be starting from 20/04/2013. Last edited by Vladimir TC on Thu Dec 06, 2018 8:55 am, edited 5 times in total. We also have demo shirt's (lim 25) size S, L and XL (M already sold out). So, be fast for this ones. The Committee shall post a new song online next week. As dead by starvation is a slow death, here's a slow song. Last edited by Vladimir TC on Tue Jul 29, 2014 7:53 am, edited 1 time in total. The chord progression in the first part would be sooo Immortal (or I) with a different context. Niet het Nederlandse The Sin Committee, maar een internationale band (waarvan minstens één Vlaamse, de drummer, de rest weet ik zo nog niet). Het zijn black en doom metal muzikanten die hun kunde samen leggen en een legering van de twee maken. Door de afbeelding van Stalin en enkele Russische klanken in de muziek zou je denken dat het een linkse band betreft, dat klopt echter niet. Aldus meldt hun pagina: History is written by the victors. WE ARE THE VOICE OF THE DEAD! niet in het minst tussen de twee wereldoorlogen. Dat er een zekere affiniteit voelbaar is met Oekraïense black moge dan ook geen verrassing heten. Holodomor betreedt geen politieke paden, de beschreven onmenselijkheid, frustratie en de ontgonnen haat voeren het hoge woord. Wanneer een stuk uit het Russische lied Katyusha in blackdoom weerklinkt tijdens Katherine's Chant bekruipt je dan ook een bitterzoet gevoel. Iets wat regeert gedurende de ganse EP. Passief-agressief, ondergaand en uitbarstend, doom en black. Geschiedenis wordt geschreven door de overwinnaars, ook in dit geval mag The Committee bepalen wat ze doen en wie ze zijn. Het is namelijk een pakkende EP geworden die zowel inhoudelijk als qua uitvoering en sfeersetting heerst. Meer van dat graag. En snel. Pred nama je izuzetno zanimljivo, a bogme i kontroverzno black metal izdanje u režiji internacionalnog sastava THE COMMITTEE, o kojem će se tek pričati i pisati. Za sada nema mnogo podataka o njima, a ovo demo ostvarenje bi trebalo tek da zagolica maštu novinara i fanova, budući da je štampano svega 50 diskova i 50 kaseta. U nastavku možemo čuti naslovnu kompoziciju, gde nas osećaj nespokoja dodatno obuzima. Muzički opet ništa posebno, a udara nas direktno u glavu, uz jezivu poruku „we have surrendered our bread“. Dobar ritam nam drma i telo, dok srce hoće da nam prepukne, koliko zbog činjenice da je čovek sposoban da učini gnusne stvari, toliko zbog toga da je isti taj pojedinac u stanju da preživi sve i svašta. Upravo to The Committee izdvaja u odnosu na druge bendove. Oni zaista uspevaju da određene teme „ubace“ u muziku, što automatski znači da, ipak, slušamo nešto posebno, bez obzira na standardnu formu i ove kompozicije. Ovaj, po svemu gledano, unikatan demo zatvara „Not Our Revolution“ koja je najmelodičnija i nekako najbliža pagan black metal stilu. Ipak, čak i tom numerom ova ekipa ubada u centar; nakon zaraznih gitarskih melodija i popaljivog ritma dolazi do black metal kucačine koja savršeno ide uz ponuđenu liriku. Kasnijim prelaskom u atmosferične vode, ponovo nas vraćaju na već poznati teren mizerije i nehumanosti, čime su na odličan način zaokružili ovu crnu priču. „Holodomor“ je, dakle, u potpunosti podređen atmosferi, a čini se da je sve osmišljeno ne bi li ovi muzičari skrenuli pažnju na razne stvari koje su ignorisane od strane javnosti ili spinovane od strane propagandnih mašinerija. Uostalom, The Committee i sami kažu „History is written by the Victors, We are the Voice of the Dead“. I mora se podvući, izuzetnom atmosferom u pesmama i veoma snažnim porukama itekako su uspeli da skrenu pažnju, kako na sebe, tako i na probleme društva u celini koji, samo naizgled, pripadaju davno prošlim vremenima, a zapravo su još uvek oko nas. The Committee is in one way pretty secret project. Why is that? Why do you want to be so mystified? Igor Mortis: Many people who only receive their information from the TV and newspapers, have a very limited view. Therefore it's important that these people judge our music for what it is, without prejudice and pre conceived notions. Our anonymity assures that. Besides, when you analyze most important historical events, you inevitably come to the conclusion that the masterminds remain in the shadows, while colorful well groomed puppets dance and play a spectacle for the masses. It is said that The Committee project is an international one. Can you share with us from which countries the members are? Igor Mortis: Off course. Our bass player is Belgian, but he has Dutch roots. Same goes for our guitarist; his origins lie in France. Our drummer has family in Ukraïne and Hungary. My origins are in Russia. For the moment we all live in Belgium. A series of strange coincidences and freak occurances brought us together. Working as an international team turned out to be very productive, due to so many differences in upbringing and way of thinking and handling. I wouldn't want to work any other way. Igor Mortis: We have to thank our drummer William for that. He’s the person who orchestrated the release on tape and cd. He’s an old skool thinking metalhead who loves to have a physical item to hold and cherish, instead of an mp3 file in cyberspace. And off course we will have to move with the current technological zeitgeist, so a digital release of Holodomor ( and future albums ) will happen in digital form, parallel to the physical releases. We have some interesting mixture of doom, black, pagan metal. How would you describe your music and lyrics? Igor Mortis: On metal archives we are classified as atmospheric black metal. It can describe our music if you never heard it before. I would say that The Committee is neither black, doom, or pagan. We play the music that best suits the lyrics and atmosphere of the moment. Thanks to our diverse team, we are not bounded by any rules or standards. Remember the feeling when you heard an amazing song that made your hair stand up on the back of your neck? This is what we are working on to achieve. From the infos that can be found online, it is said that The Committee was founded back in 2007. Your first demo was finally issued in 2013., after whole 6 years of silence. Why that long? Igor Mortis: In the beginning of 2007 I started out as a one man project. After the first draft of 3 songs was ready, the project sat on the shelf due to lack of time. Only when our drummer William heard the songs by accident in 2011, he insisted on forming a proper band. I am still mad at myself for not launching The Committee earlier. Many years went by due to procrastination and laziness. I am ashamed for that. Demo „Holodomor“ has a strong message, same as whole The Committee project, which can summon in your unique message: History is written by the Victors, we are the Voice of the Dead. Tell us something more about that. Igor Mortis: I think as a Serbian individual you can relate to this message. We all know that something is seriously wrong in this world. We can feel it every day no matter what country you consider your home. The values that we learned as children are wiped out by new empty concepts and cults. We learn the history from the point of the victors, with total disregard for lives lost on both sides. Our way of thinking is manipulated in order to judge without investigation. We are thought to obey. Our message challenges the beliefs of many people and offers an alternative view on many interesting events and facts. I think this is why our fans like what we do. We do realize that we are balancing on a thin blade of “political views”. That’s why we strongly refuse to be labeled. We bring our music to our fans, regardless of race, nation and religion. Judging from the cover of the demo many can conclude that you support Stalin and his actions, ideas. But it's not like that at all, is it? Igor Mortis: Off course Stalin was a monstrous dictator who has blood of countless people on his hands. Nobody can deny this fact. The only argument I can offer, is that I am blessed with the ability to investigate this interesting person from the side of English speaking writers, as well as Russian ones. I have the luxury of balancing all the facts and filtering the subjective material in order to come to one conclusion. Yes Stalin was a horrible person when you look at him from the democratic eyes of Western people. Throughout history Russia has been ruled by force of a strong King or leader. This is the only way to keep a country with 9 time zones together. Democracy works in the West. In Russia and other nations ( for example the Middle East and China ) the only way to get things done, is by force. Results matter! Before Stalin, the country was a peasant community. He managed to transform it into an industrial superpower. In the West this was done by the so called fiat currency system. In Russia this was done by the blood and sweat of millions of people, simply because the monopoly of printing money belongs to other nations. We do not support the actions of Stalin. We consider him to be a very interesting person who gave the Imperial regimes a run for their money. This fact alone makes history so interesting. It seems to me that your idea was to explain the people couple of things about history, oppression, media coverage, etc. Do you think that people will hear your message? Are they ready to listen some different views? Igor Mortis: First of all, most metal fans I know are very smart and educated people. Our message is not meant for the masses of people who are happy with a 9 to 5 life with highly anticipated drunken weekends. We KNOW that our fans are interested in what we have to say. Simply because we feel the gravity of everyday life and we know that everything is not as wonderful as the media wants us to believe. And second, we are just too tired of hearing so many bands that worship Satan and paganism as their main theme. Not much new stuff has been done these few years. We want to bring something new and exciting to our fans. For now the response has been beyond our expectations. We are continuously motivated to go on and work even harder. What does the song „Not Our Revolution“ stand for? We have some sort of a hidden song in it, as well. Igor Mortis: “Not our revolution” tells a story of a small group of foreign people who overthrew the Czar and took control over Russia in 1917. Unfortunately every country that has natural resources or shares an excellent strategic position on the map ( just like former Yugoslavia ) will always be targeted by other nations to profit from. In the game of life, anything goes. Any method and trick, no matter how immoral and macabre it may be, is used to take control. The only way a nation can survive this atrocity, is by unity of people and strong leadership. “Not our revolution” is a template that is used up to this day. I suppose your next move will be a full-length. When we can expect it? Are you going to release it yourself or through some label? If you can, tell something more about the debut album. Igor Mortis: The full length album is scheduled for the end of 2013. It will be in the same grim theme as the demo, however we want to focus upon the stories of individuals who lived in the turbulent years of the Russian revolution and the Stalin era. It’s important to notice that unity plays a big part of the full album. We have a lot of work to do in order to create a very dark and guttural sound. When our fans listen to our music, we want to make sure that they are dragged inside the songs to experience everything with all of their senses and imagination. Off course the full mastering of the album will be outsourced to an external professional due to the critique of our current sound. We want to improve ourselves every step of the way, because our fans deserve only the best we have to offer. As far as the release goes, we are very realistic about the underground scene. We know that many labels are struggling to make ends meet due to competition from online retailers and mp3 releases. That’s why we won’t make too much effort is promoting ourselves as a potential band to “sign”. We believe that if you are good enough, there will be interest from the labels themselves. We hate it to be “in your face” band who scratches on every door. We are open for collaboration and off course we would like to release vinyl as well as CD’s, tapes and mp3’s. Any plans for live show in the future? Igor Mortis: Most definitely. We will play live shows from the moment our full album hits the scene. Our only wish is to keep our anonymity. Big thanks for your time and good luck with the project. I really hope that The Committee music will be recognized by many fans! Thank you for your interest in our band. From what we hear so far from our fans, keeps us motivated and hungry to do even more. Berto : Een band met inhoud, daar houden we van. The Committee bestaat uit vier leden die uit vier verschillende landen komen. namelijk de hongersnood in de Sovjet Unie in de jaren twintig en dertig gedurende het bewind van Stalin. De band wil de stem zijn van de overledenen en ze beschrijven in de teksten dan ook deze morbide en duistere periode uit de geschiedenis op zeer effectieve wijze. Met alleen deze informatie zou je de muziek er zelf al bijna bij kunnen verzinnen en de blackened doom past perfect bij de zwarte teksten. dan kan je niet anders concluderen dan dat de band met deze sfeer, de teksten en de muziek een perfecte geschiedenisles hebben neergezet. Muzikaal niet al teveel nieuws onder de zon, maar prima uitgevoerd en zeer effectief. The Committee is a collaboration of blackened doom artists from different countries that have set out of create a diverse, crushing sound that brings awareness both lyrically and instrumentally. Focusing on themes like history, their debut demo "Holodomor" is brief, but full of epic sounding tracks. The opening 'Utopian Deception' starts the album off with a powerful insturmental that definitely lives up to the doom metal side, but the black metal hits once 'Katherine's Chant' comes forth. This is pretty much the staple sound for the group with the fuzzy tremolo picking, faded vocals and plodding drums. but the quality is certainly hypnotic and will live up to most doom/ depressive black metal expectations. The closing 'Not Our Revolution' features a good length of quiet before giving way to the easter egg hidden near the end that features chanting and singing but most fans may feel that the wait wasn't worth the gift. the choirs near the end of the last track were excellent and could have been used more in mix with the music itself. A fast song from the "Holodomor" demo. Last edited by Vladimir TC on Tue Jul 29, 2014 7:48 am, edited 1 time in total. Today we are proud to announce the arrival of our limited edition pins for our fans. Atmosphärische schwarzmetallische Klänge mit einem Blick in die sowjetische Seele. Aus Belgien ist uns die erste Demo-CD einer multinationalen Band namens THE COMMITTEE ins Haus geflattert, deren Mitglieder serbischer, ungarischer, russischer, französischer und niederländischer Abstammung sind, und die keine Berührungsängste mit totalitärer Ästhetik zu haben scheinen. Denn auf dem Artwork prangt die heroische Büste des Josef Stalin, die Bandinsignien erinnern an die Sowjetunion und das Album ist nach einer völkermörderischen Hungersnot in der Ukraine benannt. Soll hier also quasi ein Gegenentwurf zum Schwarzmetall vom rechten Rande zelebriert und der stalinistischen Diktatur gehuldigt werden? Nun, die Band bestreitet dies und sieht sich als unpolitisch. Die Geschichte werde von den Siegern geschrieben und die Band wolle den Toten eine Stimme geben, vorliegend den geplagten und unterworfenen slawischen Völkern. Die Erklärung klingt plausibel, denn die Band bezieht in Interviews und auf ihren Internetpräsenzen auf durchaus reflektierte und auch kritische Positionen, so dass ich für politisch korrekte Anwandlungen vorliegend keinen Raum und keine Not sehe. Daher wollen wir uns der Musik zuwenden, welche einen klaren schwarzmetallischen Schwerpunkt hat, diesen jedoch mit deutlich spürbaren doomigen Momenten verfeinert. So könnte der instrumentale Opener 'Utopian Deception' auch wunderbar zu einer Funeral-Doom-Scheibe passen. Der folgende Neunminüter 'Katherine's Chant', der sich auf die berüchtigten Katjusha-Raketen der Roten Armee bezieht, deren Werfer diesseits der Front als Stalinorgeln bekannt waren, zeigt dann die ganze Klasse der Band. Melancholischer, dabei aber sehr traditionell ausgerichteter und eingängiger Black Metal singt das kalte Lied der Taiga, flicht dabei zunächst ganz dezent slawische Folklore ein, um letztlich in das bekannte russische Volkslied 'Katjusha' zu münden. Dieser dramatische Paukenschlag lässt sich schwerlich übertreffen, doch die Band versteht es, das Niveau hoch und die Spannungskurve stabil zu halten. Das Titelstück 'Holodomor' gibt sich programmatisch hoffnungsloser und marternder, doch auch hier bewegen wir uns in einem absolut klassisch-schwarzmetallischen Bereich, der von flirrendem Gitarrenstrumming, rauem, verhalltem, hintergründigem Gesang und stoischem Schlagzeug lebt und im elegisch-majestätischen Midtempo dahin schreitet. Zum Ende hin wird dann mit 'Not Our Revolution' auch noch das Tempo merklich angezogen, wodurch der (durch einige Minuten Stille zweigeteilte) Viertelstünder eine weitere überzeugende Seite der Band offenbart und am Ende in einem Outro mit massiven Blechbläsern und russischen Chören endet, welche aus einem sowjetischen Film der stalinistischen Ära stammen könnten. Auf EP-Länge kann diese Band jedenfalls musikalisch auf ganzer Linie überzeugen, wobei das russische Element sehr präsent ist und vor dem inneren Auge die weiten der Taiga ebenso aufflackern lässt wie alte Kriegsberichte von der Ostfront. Damit fängt die Band wohl genau die Atmosphäre ein, welche ihr vorschwebte. Defintiv eine neue Band im schwarzmetallischen Sektor, die über großes kompositorisches Potenzial verfügt und die es zu beobachten gilt. Official digital release from the HOLODOMOR demo by Grom Records. The whole Holodomor demo is online now. Here 's the instrumental Intro song "Utopian Deception". For fans who like some funeral doom. Our dear Friends and Fans! The Campaign is finally upon us! From this day on The Committee will award the fans ( and owners of our physical albums ) with ranks. The EP holodomor ( and the limited shirt ) will be awarded with the highest rank. What does this mean for you? You can proudly wear your seal and prove that you have been there from the beginning. Dear Fans and Friends. We have been quiet for a while. There are some important announcement from The Committee for you. 1. The final stages of the recording of our full release "Power Through Unity" are coming to an end. 2. From this day on: We confirm that we will play live shows after the release of "Power Through Unity". 3. We have added an online shop to our homepage. Check it out! 2. First live concert has been confirmed. More info will follow. This vacation time is a time of getting rid of the piles of music which are staked up and wait for reviews. One of the by far most overdue releases is a CD I received so many moons ago that I can't even remember when it was! The demo CD is from a band called The Committee, and the CD is called 'Holodomor'. like the capture and submission of Russian and Slavic people. Heavy stuff indeed. So, the picture of comrade Stalin on the cover is no coincidence, eh? Reading through the lyrics, you can tell that there's quite a bit of emotion and anger going through the individuals behind The Committee. Apparently, my research on the net tells me, the band consists of members of different European nationalities, their common language, though, being metal. The first track is something I'd call a pure doom instrumental. The next three songs still maintain a doom feel, but The Committee turn out to be more of a black metal band than actually a doom band. As other recent reviews on this site will tell you, I'm not at all a fan of old school black metal, and yet I like this. sweeping feel to them and come in over you like waves of emotion, a bit like Russian music can do. Much the same throughout the three songs, really, but still I like what they do. The Russian choir at the end is just spot on as a grand finale - and exactly the way the great dictator would celebrate and glorify his murder of millions of innocent people. 'Holodomor' is not the best produced album out there. By no means. Still, The Committee manage to purport a lot of emotion, the feeling of death and cold, and the cry against the injustice done by the dictator Stalin was. First full album "POWER THROUGH UNITY"
Will be released via Folter Records from Germany at the end of February 2014. + First conformed gig: "Under The Black Sun 2014" in Germany. 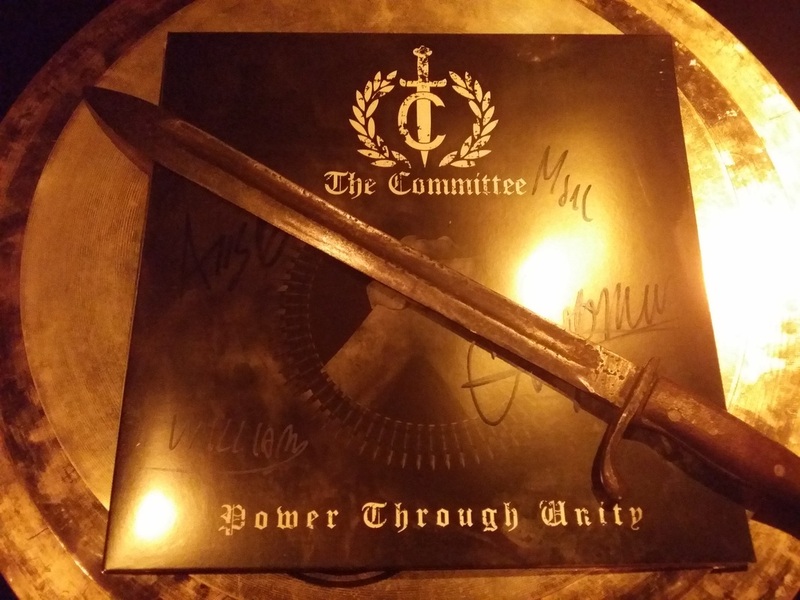 We are very proud to inform you that today the debut album "Power Through Unity" of THE COMMITTEE has been released! A LP version is planned for May. Sizes, S, M, L & XL. - "Power Through Unity" shirts are almost sold out (only still some size's M and XL remain) so be fast. - The Committee is preparing everything for the LP version of "Power Through Unity". Last edited by Vladimir TC on Tue Jul 29, 2014 7:47 am, edited 1 time in total. - 10 days to go until The Committee is presenting the new album "Power Through Unity" at the Under The Black Sun festival. - "Power Through Unity" shirts are back in stock. - Holodomor tapes are sold out. - Holodomor shirts are almost sold out. Only size S and XL are in stock. - Power Through Unity vinyl will be ready August 15th. Last edited by Vladimir TC on Tue Jul 29, 2014 7:46 am, edited 1 time in total. Today we release our limited edition t-shirt of "Katherine's Chant". NO REPRINTS WILL BE MADE! Be fast, just one hour after the announcement and half is already reserved. The Committee is proud to bring you some new big announcements! New video "The Last Goodbye" is online now! - The first press from the cd version from "Power Through Unity" is almost sold out. Folter Records will do a reprint soon. The reprint will not contain a "General" patch. - Folter Records will soon release a PicLP from our "Holodomor" demo. We are proud to announce the new embroidered Hoodies from The Committee. Unfortunately all Hoodies are already pre ordered/reserved. Delivery will start from 15th of december. - The Committee will open at Friday 12th December on the Large Stage at Eindhoven Metal Meeting at 16:40.
i was at there in eindhoven good gig. Although the 2nd vocalist seemed to be a bit underused. We have long sleeves. See below. We have long sleeves in size's M, L and XL. But be fast. Size XL is already almost sold out. 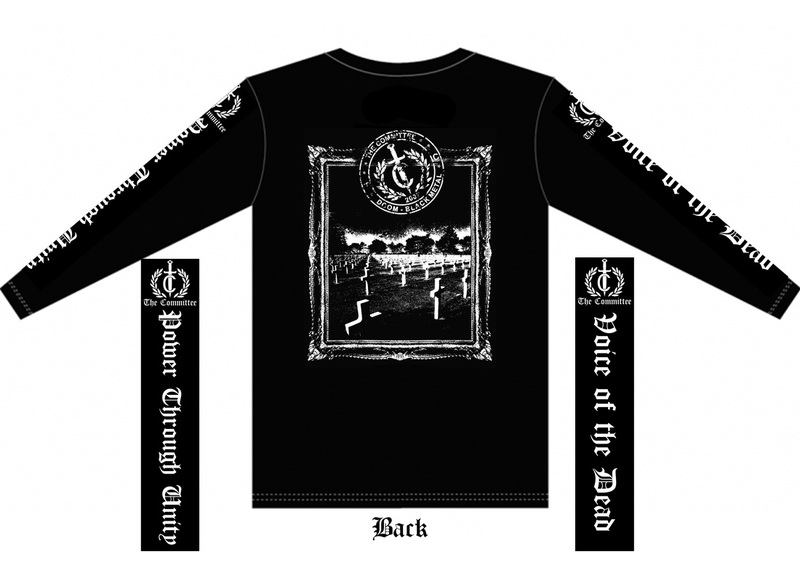 Because of the requests for the release of the Holodomor shirt, we have prepared a new limited edition of 50 pieces. 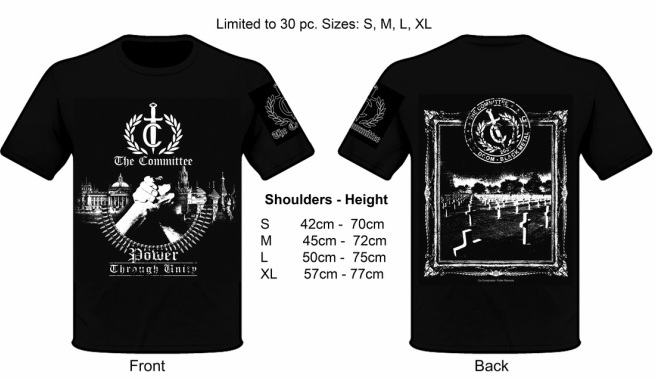 Email us at the-committee AT hotmail.com for your order. The first song is a new one from our upcoming album.